One of the Pop Art techniques that Andy Warhol pioneered was the appropriation of photographs. He starting using the PhotoSilkscreen process in 1962 - this allowed him to 1) enlarge a photograph and 2) project the image onto a canvas multiple times. 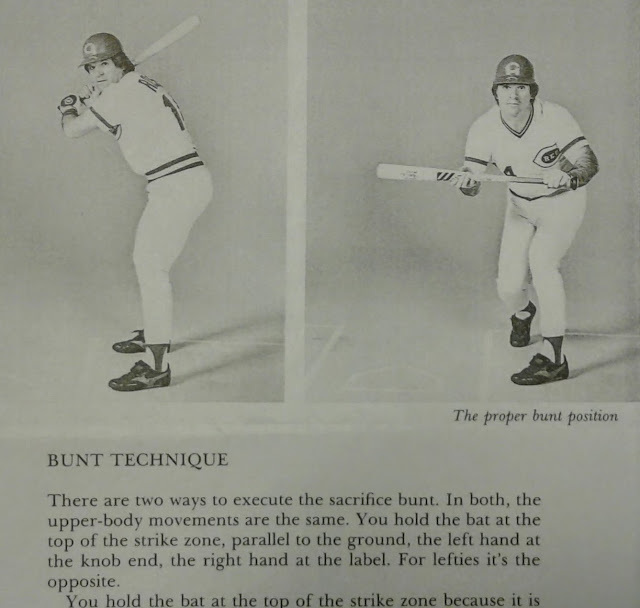 His first use of this method can be seen in the painting Baseball. Andy would use the PhotoSilkscreen once again when he produced his portrait of Pete Rose in 1985. Originally it was hoped that Pete Rose would visit Andy Warhol[s studio for his portrait, alas the busy schedules of the two men made coordinating the sitting impossible. This is the only copy of the Baer photo that I could get. I assume the one that Warhol used was in color, however most of Gordon Baer's photography was in B&W. Baseball historians have noted two interesting issues with the Warhol painting. 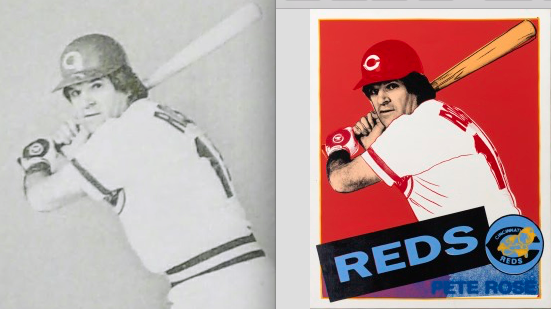 In 1985 Pete Rose used a Black Mizuno brand bat, in the Warhol painting the bat has a clear stain. Notice that the bat in the Baer photograph also has a natural stain. The second complaint is that the switch-hitting Rose was portrayed batting right-handed by Andy Warhol. "Only" 1171 of Pete Rose's 4256 career hits (28%) came from the right hand side. By 1985 the percentage of Rose's RH hits dropped below 16% (17/107). Once again since Andy was reproducing a photo with Rose batting right-handed he ended up with a RH painting. During the 1985 season there was a flurry of activity around Pete Rose's pursuit of Ty Cobb's hit record. One of these projects was "Pete Rose on Hitting: How to Hit Better than Anybody" which Pete co-wrote with Peter Golenbock. The photography for the book was done by Gordon Baer and includes the picture that Andy Warhol used for the Rose portrait. Yes the photo used by Andy is a associated with Pete Rose's entry dedicated to bunting. Gordon Baer's work dates back to the 1960s including a stint as a military photographer in Korea. During the 1980s his NYC exhibition titled "The Battle Comes Home" featured photographs of Viet Nam veterans - many of whom likely suffered from the then unnamed Post Traumatic Stress Disorder (PTSD). You can read about his a 2012 retrospective of Baer's work here. Bsseball (1962) Andy Warhol - Roger Maris ? ?